St. Dunstan's Cathedral Basilica is a stone French Gothic church built in 1913 from the remains of the cathedral that had been damaged by fire that year. 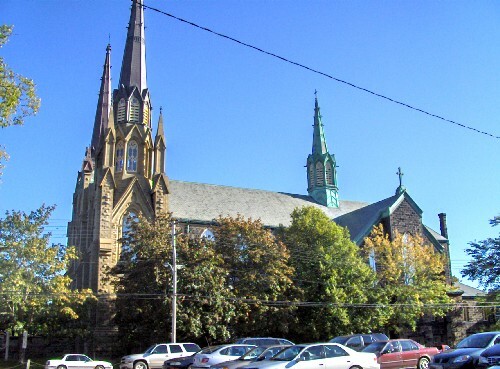 St. Dunstan's is the fourth church on the site and one of the most visible landmarks in Charlottetown with its spires being some of the highest points on the City skyline. It is the only Roman Catholic cathedral and basilica in the province and one of the most elaborate churches in the Maritimes. The designation encompasses the building's exterior and parcel; it does not include the building's interior. The heritage value of St. Dunstan's Cathedral Basilica lies in its importance to the Roman Catholic community of Prince Edward Island; its magnificent French Gothic architecture; and its role as a landmark in Charlottetown. The first St. Dunstan's was a small wooden chapel built in 1816. The church received its name from Archbishop Plessis of Quebec who, when he visited the capital in 1812, was received warmly by local Protestant British officials. He named the church that would later be built St. Dunstan's after the 10th Century English saint, as a goodwill gesture to those who had received him so well. By August 1829, the Diocese of Charlottetown had been created with the installation of Father Angus Bernard MacEachern as Bishop at St. Dunstan's chapel and as a result, the tiny chapel became a cathedral. In 1843, a larger, wooden Gothic Revival cathedral was constructed, which faced Dorchester Street. The 1843 church served the Roman Catholic community for a time, however in 1886, the congregation asked that a larger, more elaborate, church be built. Eventually Montreal architect Francois-Xavier Berlinguet was hired and designed a new French Gothic Cathedral to be built of stone. The cornerstone of the new church was laid 15 September 1896 and the entire church was completed in 1907. 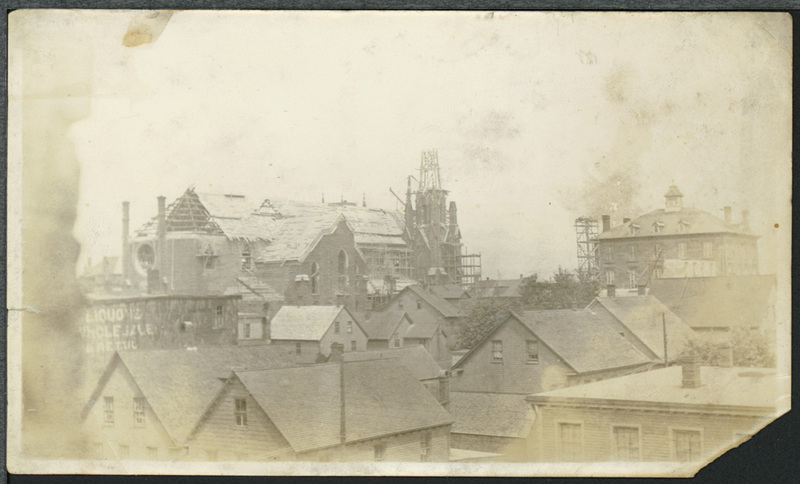 Unfortunately, in 1913, a fire that had started in the sanctuary devastated the new church. Before the fire was extinguished, plans were made to rebuild the cathedral. Donations from Roman Catholics throughout the Island, as well as non-Catholic members of the community helped to rebuild the new church, which was completed in 1919. This church would be built with an extensive array of fire resistant measures so that the church would never succumb to fire again. Contractors, James Metcalfe and Company Limited and Scottish architect, John Marshall Hunter were hired to work on the project, as was Mr. Godio of Paris who worked on the vaulted ceilings and scaglioli and Mr. Nacenti, whose firm was responsible for the marble and stucco. After the fire, it was found that the facade and portions of the walls were salvageable. Instead of creating a replica of the original interior, Hunter redesigned an English Gothic inspired interior that ultimately resulted in a brighter effect within the church. This was accomplished through his design, as well as opening up several blind windows in the transepts and towers and adding an extraordinary rose window above the altar. Other changes were made to the overall design such as the lengthening of the spires, modification of the clerestory windows and slate roof and the addition of a two-storey sacristy onto the west side of the church. 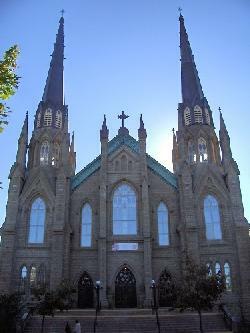 The interior is said to resemble that of St. Patrick's Church in New York City. When viewed from above, the church's cruciform plan becomes evident with a polygonal apse, substantial transept arms, and twin towers at the eastern end with spires rising 200 feet. St. Dunstan's was formally dedicated on 24 September 1919 by the Most Rev. 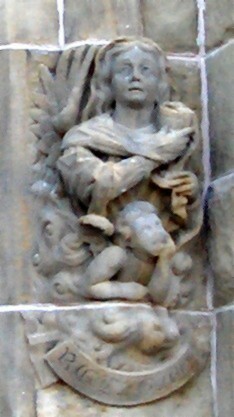 Pietro Di Maria, Archbishop of Iconium. 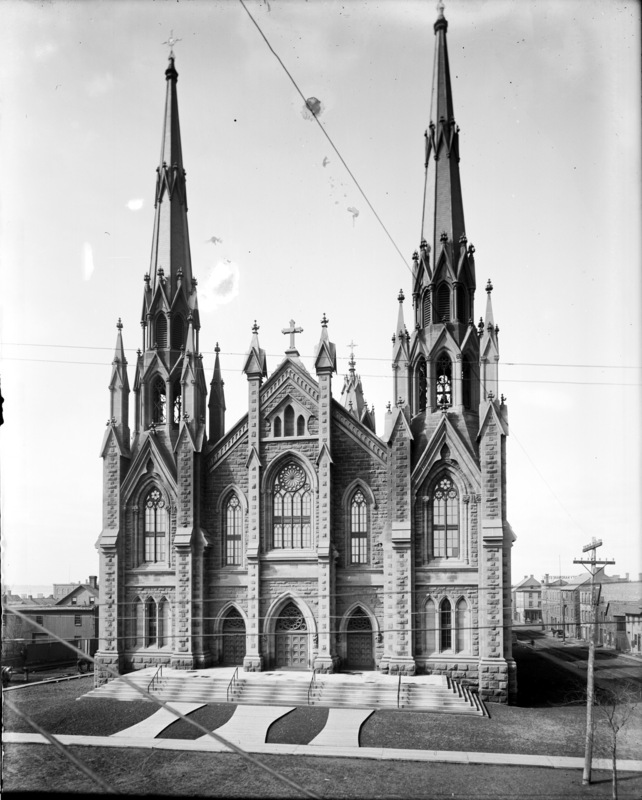 The official consecration of the Cathedral, at which time it became the second church in English speaking Canada to become a basilica, took place on 26 June 1929 one hundred years after the Diocese of Charlottetown was created. 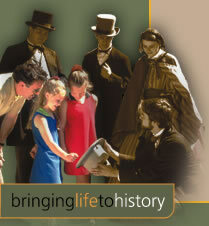 In 1990, the church's architecture was recognized when it was designated as a National Historic Site. Since the 1980s, St. Dunstan's has been undergoing extensive restoration work to strengthen and clean the building. A beautiful church and a local landmark, St. Dunstan's Cathedral Basilica is a source of pride to the Diocese and the City of Charlottetown. Situated in an area with a great number of historic buildings and churches, including the 131-year-old Episcopal Residence next door, St. Dunstan's supports the heritage character of the area.